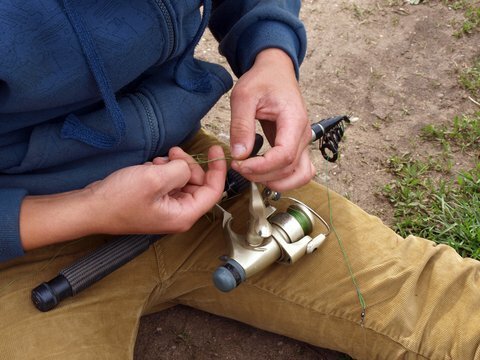 Fly fishing requires anglers to master a variety of knots, probably more than any other type of fishing, so confidently knowing how to tie fishing knots is critical. There are knots for connecting lines, knots for connecting leaders and still others for connecting flies. With so many knots to learn, it can seem confusing, but the key is to learn a few crucial knots and stick with them. Below are the five basic knots every fly fisherman should know. We will start from the reel and work our way to the opposite end of the line, covering each connection along the way and how to tie fishing knots for each. The first knot that is important for fly anglers is the arbor knot. This is used to connect the backing line to the reel. Not all fly anglers use backing line, but it is highly recommended, especially if you are fishing for larger species of fish. It also helps you wind in and pull off line from your reel more quickly. The arbor knot is fairly easy to tie and offers a strong connection to your reel. It is easiest to tie with the reel connected to the reel seat. The albright knot is a crucial knot if a fish ever takes you into the backing. It is a very strong knot used for connecting your backing to the fly line. Among the fly fishing knots, it is one of the more complicated to tie, so take your time to make sure it is tied correctly. With your backing and fly line on the reel, the next knot you will need to tie is the nail knot. The nail knot connects the leader to your fly line. This is an especially important knot, because this is one of the connections most likely to fail if the knot is not tied correctly. The nail knot gets its name because anglers historically used a nail to tie the knot. However, a hollow object, such as atubesthe outer portion of a ball-point pen, actually works much better. The nail knot gives you a crisp, clean finish on the connection and offers exceptional strength. The last link in the connection of line is securing the tippet to the leader. Here you will need the double surgeon’s knot. Outside of tying your fly to the line, this is the knot you will tie most frequently, often when you are on the water. Once you learn it, the knot can be tied quickly so you can resume fishing with little time wasted messing with knots. The final connection in the parade of fly fishing knots is tying the fly to your tippet. The most frequently used knot is the improved clinch knot, which most anglers are familiar with. It is easy to tie and provides a strong connection. Always remember to wet the line before snugging this knot tight.